© 2019 Workspace Group Inc. All Rights Reserved. The latest in furniture trends & news - straight to your inbox! 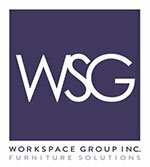 Sign up for Workspace Vibes - our monthly newsletter.